Madison: I woke up to the beautiful crashing waves of Malibu beach out side my window. I laid there thinking that today was a dream. I get to marry the most amazing man in the world. I prayed for this day for so long. We had rented a Malibu Beach House the week of the wedding and the weather had been on and off, but on the wedding day, God gave us the most beautiful sunny morning. We even had dolphins come by our house! Hair and makeup started at 6am! Now, I got my beauty sleep, so I got up while all of my beautiful bridesmaid were getting all glammed up. My mom made my favorite breakfast for everyone and I sat on our porch, drinking coffee, sipping on mimosas, and finishing up my vows. Once we were all finishing up hair and makeup, it finally hit me like wow.. I am getting married in just a few hours! I had never felt more beautiful. My bridesmaids and I got all together and pop'd champagne on the beach, jumped on the bed, and had given me all their advice and memories we have had together. My mom and I went off and got our dresses on, and my mom helped me get all buttoned up, and I got to wear her beautiful pearl earrings. My bridesmaids came out looking beautiful and we did a fun surprise dress reveal to them which was priceless! Now, its time! We all got everything ready to go and headed for our white limo that drove us up the mountains of Malibu into the canyons. We arrived to Calamigos Ranch and I hid, so Chris wouldn't see me. We got to our bridal suite and saw the most beautiful bouquets. Now it's really starting to kick in. We took our bridesmaid photos, and then I got to surprise my Dad in my dress which was the sweetest moment. There were definite tears from both of us. My girls and I got back to our suite and put on some Justin Bieber and just relaxed as guests started to arrive. the next 30 minutes went by so fast, and by the time I one wit, I started to line up at the top of the stairs to walk to my dad. The processional was a string quartet version of Ed Sheeran's Thinking Out Loud. Then, as I made my way down the balcony, was playing a string quartet version of “Can’t help Falling in Love”. I was overwhelmed with emotion and was knew that I was ready to marry the love of my life. Our ceremony was so us. Very passionate, warm, heartfelt, and some humor! The setting under the old oak tree was breathtaking and had thousands if twinkly lights hanging down. It felt like we were floating atop a cloud of ivy. Our recessional was a special song for my dad, the Dodgers’ theme song they okay after every home game, “I Love L. A.” Walking down the aisle with my husband in hand was the best moment of my life! We are married!! The rest of the night was the best, most fun I’ve ever had with all my closest friends family, and my hubby! Some of my favorite details were our custom neon sign with our hashtag “Oh Happy Desmarchais”, our dreamy floral across our sweetheart table, the beautiful hand dyed paper flower piece that hung down in our twinkled out tent, and our 4 tier blush dyed gold drop semi naked cake!. One of my favorite memories was our first dance to Ed Sheeran’s “Perfect”. Of course we had a choreographed dance because EXTRA! Lol. I LOVE to dance so having that dance will be something for us to dance to for the rest of our lives. And can't forget the vintage VW Bus Photo Booth, so glad we had that for the end of the reception, definitely had some chuckles from seeing all the fun pics of our guests!We are so thankful for our team of vendors who made this night one to remember! We love you all! Chris: My wedding day was the best day of my life. To be honest I had a hard time falling asleep the night before, thinking about everything that was to come the next day. The moment didn’t quite hit me until guests starting showing up at the venue. My groomsmen and I were waiting in our room killing time until the ceremony began. Seeing all the people filter in really brought to life that this was really happening today. As I stood in the back preparing to walk out I felt a sense of calm because I knew with all my heart I wanted to spend the rest of my life with Madison and I was excited to get started. I knew how important this day was for her and how much work she put in to make it what it was. So when I saw her come down the isle looking more beautiful than ever I could not help but smile. From that point on I did my best to savor the day in be present in every moment. My wedding day honestly exceeded every expectation. 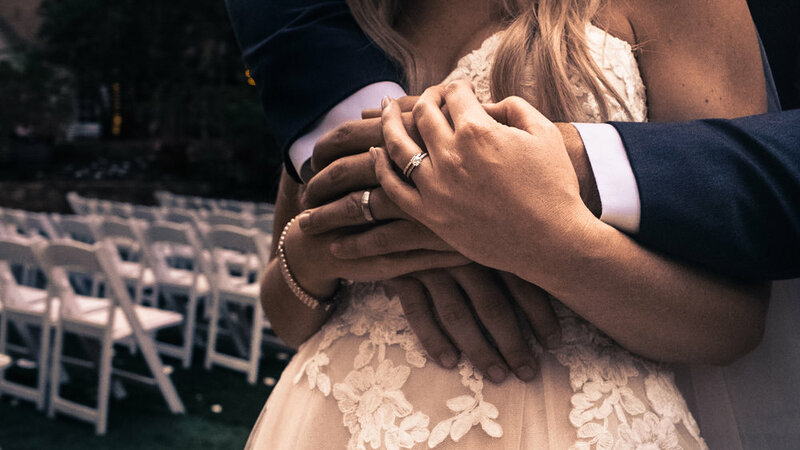 Every aspect from our ceremony and vows, to our first dance and the time spent celebrating with friends and family are memories that I will cherish rest of my life. If I were to do it all again I wouldn’t change a thing.